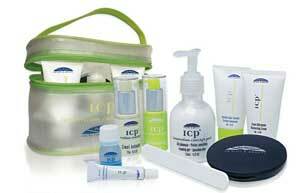 Launched in the U.K.in 2004 the Innovation Concept Peel (ICP) is a treatment for the elimination of all sorts of pigmented spots including freckles, age spots, pigmented scars. It also helps to improve the appearance of areas of roughened sun damaged skin and actinic keratosis. Salicylic acid, hydroquinone, kojic acid, phytonadione. It visibly smoothes and softens skin, improves and balances irregular skin tones. It can be used to improve a variety of pigmented skin problems including age spots. ICP can be used on the face, the neck, the chest and the hands and can be used on all types of skin including: Fine skin, normal skin or greasy or thick skin. Degreasing Solution: Salicylic acid and alcohol. ICP Cimel Activator: Hydroquinone, kojic acid, salicylic acid, phytonadione. ICP Cimel Maintenance: Hydroquinone, kojic acid, phytonadione. Pregnant or breastfeeding women,or people prone to scarring. The ICP peel should only be performed as an in-office procedure by a trained professional. It provides controlled and predictable removal of surface skin cells, stimulating skin renewal to improve the appearance of the skin. The patient`s skin is carefully cleaned with the Degreasing Solution. The mask is is applied and may be left for 2 to 8 hours depending on your skin type and the problem requiring treatment. After cleaning and removing the mask with the Foaming Gel, your skin may appear slightly red. Some mild peeling may occur after a couple of days and the skin should show some improvement after 3 or 4 weeks. A second application may be necessary after 4 to 5 weeks have gone by. All body areas appear to respond well to treatment with this peel; however, the arms, hands, neck and chest all improve at a slower rate than the face. Most patients can undergo ICP peels with few side effects. Some redness is temporary and normal, and the skin may also be slightly swollen and may itch for a few days following treatment. Again, this depends on area treated and how much is required, and the practitioner doing the treatment, but ranges are in the region of: £460 per treatment session. Click for ALL Innovation Concept Peel ( ICP ) clinics in the UK & Ireland registered and verified by Consulting Room.